The pumps and drives are immensely durable, we expect and routinely achieve thousands of hours from our machines employed in the most demanding of industrial environments. Well looked after, these hydrostatic units will simply go on and on. The Ultimate in Handling and Safe Control – Mudd-Ox Hydrostatics deliver precision in the control of power, drive and traction, assuring exact control even in the harshest of environments. There is no loss of traction or torque when steering and extremes of gradient are handled seamlessly; forwards or in reverse. Control Simplicity – Regulated engine speed with torquey engines and no requirement for gear changes – no distractions. Zero Turning Radius – fully independent port and starboard control of drive. The ability to contra-rotate port and starboard wheel-sets allows Mudd-Ox to rotate on the spot on land or in water. Ride Quality – superior ride quality from matched hydrostatics, body, chassis and our own Vendetta tires. 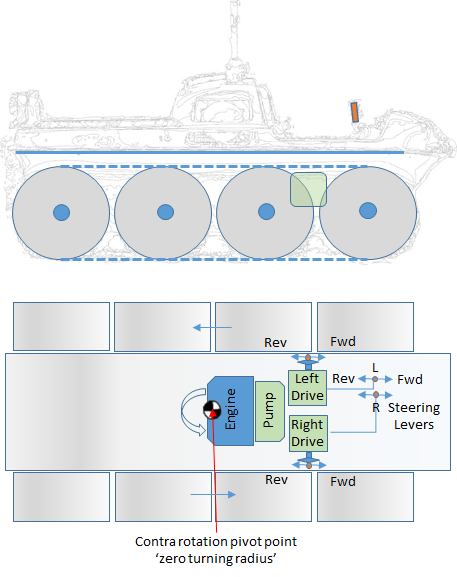 The principle underlying our hydrostatic drives is illustrated in the schematic below. The engine drives a pump which provides hydraulic power to left and right drives, these are completely independent of each other and the direction and speed of rotation of each is controlled by the respective steering lever. As the left lever is moved forward the left set of wheels rotate more quickly at a speed that exactly matches the degree of movement, as the lever is pulled backwards the wheels slow. As the lever passes backwards through the neutral point the respective wheels change direction and rotate in reverse. Once again, the speed is exactly matched to stick movement. Gentle, fingertip control can be achieved for very precise movement, torque is applied exactly in accordance with control input and the high capacity drives can convey massive amounts of power as required – offering both power and precision without compromise to either. By moving one lever forward and the other backwards the wheels on one side can be made to rotate in the opposite direction to the other. This provides a stunning level of precisie positional and manoeuvre control, for instance the machine can easily be made to rotate about its centre point. This degree of precision cannot be achieved using conventional skid steering, which brakes the wheels on one side and causes the vehicle to ‘skid’ around the braked wheelset. This type of control also reduces wear and tear on tires and transmission.